Welcome back! This time I’m pleased to have David Gregg as my guest. 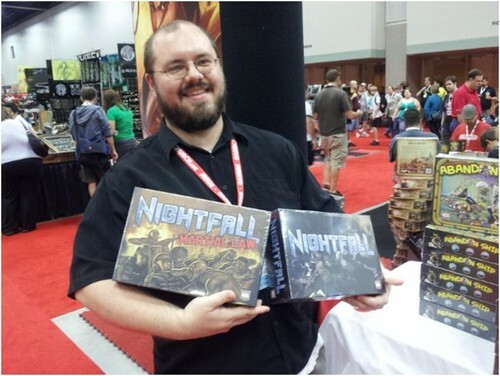 David is the designer of the Nightfall deck building game from AEG. He’s also a great guy. See for yourself. Tom: David, I know you are a fellow North Carolinian but what do you want to tell us about yourself? David: I’m the trainer and junior IT guy for a plastics manufacturer called Starpet. I work on pretty much anything computer related from fixing our network to web development for our laboratory and plenty of the more boring stuff such as typing and reformatting our training documents. Tom: What game got all this started? David: I first got serious with gaming with Chess in high school and quickly found out about Magic: The Gathering. I competed with both MtG as well as the Yu-Gi-Oh TCG (I even ran a league out of our local mall), but starting a family made all that near impossible to maintain. That’s when I found out Board Game Geek and just how vast the world of board gaming had become. 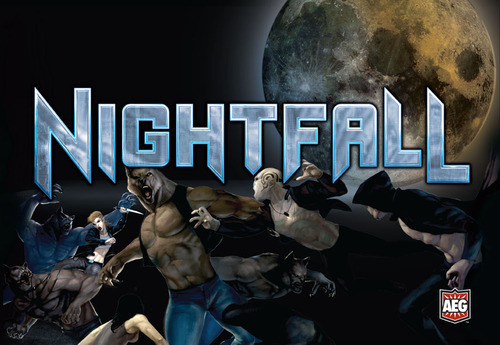 Tom: You have one published game – Nightfall from AEG. I’ve played it and enjoyed it. Tell us how if came about. David: Shortly after finding BGG I heard about Dominion and really like the deckbuilding mechanic. My family enjoyed the game immensely and we even got some of the expansions. Unfortunately, it was missing that direct player conflict that I enjoyed so much from my MtG days. So I decided I’d take a shot at merging the ideas into a game of my own. The first few iterations were more like Magic and did not mix well with the deckbuilding mechanic… not at all… What really got the game going was when I created my mechanic. After that develop really picked up and my friends got excited to resume playtesting. Tom: How did you get it picked up by AEG? David: I was posting my progress on the BGG forums, getting feedback and a ton of help with ideas from the users there. As I was nearing completion with the game, Todd Rowland contacted me via a geekmail. Turns out that AEG had been seeking out a deckbuilder with direct player confrontation and were watching the forums for people like me, hoping to run into something that would fit their goal. Not long after that geekmail we spoke via phone and then a few of them even flew out to playtest my game in person and discuss things. Tom: So first game out of the gate gets picked up by a major publisher. Man, you can’t complain about that. Did anything change from initial concept to final product? David: Everything. 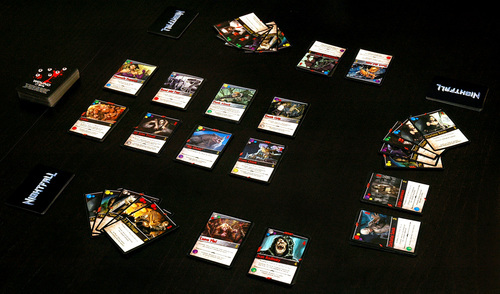 The deckbuilding and combat bits of the game used to be separated into their own phases. 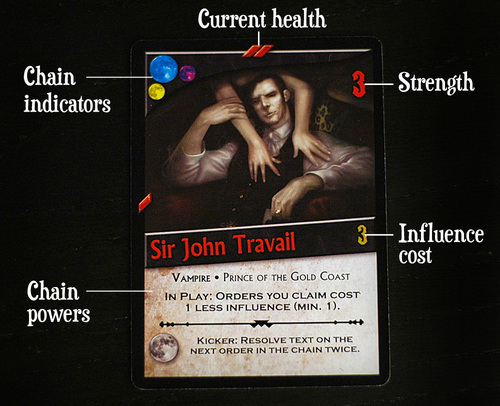 Your money used to be separated from your deck and built up as the game progressed, ramping up what you could buy into the late game. Your deck used to be your life and you lost cards as you were injured. The starting deck used to be a combination of money cards and “shields”, which are essentially the yellow starter minions now. Those shields used to be sent to your discard pile to reappear later, so a slim deck could maintain an impenetrable defense. The chain mechanic was developed mid-way through the game’s development. The starters themselves along with the wounds weren’t even added until after I was picked up by AEG! Tom: How was the interaction with AEG? David: They were really easy to work with. We quickly exchanged email addresses and got in a quick phone call to discuss some early options. When they visited me in person they started out all business, wanting to dig into testing, but as we played they quickly livened up and we all had a good time. Contract was pretty straight forward and they even added some perks for me when I asked for them. Now we mostly communicate via email, IM or Skype and there’s nearly always someone available within a reasonable timeframe if I had an important question. I’ve interviewed and interacted with Todd Rowland and found him to be a fantastic guy. David: The chaining mechanic is a biggie here. Instead of the standard “play 1 card” type deal you can now play as many cards as you want, so long as you deckbuild well. A poorly built deck won’t be able to play as much while a well-built deck will empty their hand often. 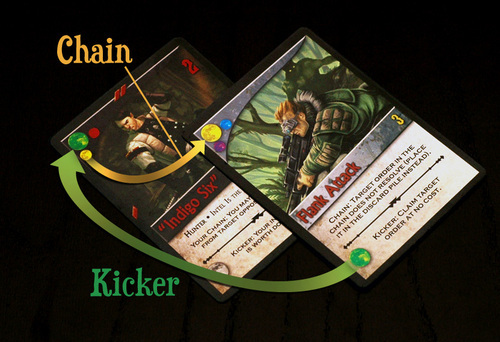 You can also build differently as to whether you want to aim for playing huge chains on your own turn or just drop smaller bits of chains attached to the ends of your opponents’ chains. Using wounds as a both a negative point system as well as the comeback mechanic seems to be unique among deckbuilders. And of course the others tend to lack any direct conflict, making Nightfall the more aggressive of the bunch. Tom: The chaining mechanism is very interesting. Understanding it is key to playing well. How did you come up with that? David: I hit a wall in development when I was first trying to merge the deckbuilding and actual playing of the cards into a single phase vs. being separated. I knew that I wanted to get away from limiting players to a single turn and I wanted to reward players who deckbuild well. What first came to mind was the 5 color system back from Magic: The Gathering. I wasn’t quite sure how I wanted to do things, but I knew it had to be as even and balanced as possible, so I chose to go with 6 colors instead of 5. After buying a large dry-erase board and a ton of sticky notes, I went to drawing various patterns, assigning characteristics to the colors ala Dungeons and Dragons as well as lots of other little ideas. What emerged was a system that had 3 primary win condition colors and 3 supporting colors that actually made it really simple to work with. In the base game, I simply created 4 cards from each color with 2 linking clockwise and kicking counterclockwise and then 2 linking and kicking in the opposite direction. Initial tests of the system worked so well that all that remained to do was simply balancing the effects and perfecting the supporting mechanics. Tom: That is a great development story. I’m working on a card game myself and am interested in how you went about balancing the game. Would you speak to that? David: Well I like to start with balancing things as mathematically as possible, having cards with numerical effects having very direct cost-to-effect ratios. Unfortunately it takes a lot of iteration to perfect those ratios and even more iteration to find the “sweet spot” for non-numerical effects. In short, find a bunch of family and/or friends who don’t mind bashing their head into your game for a while. David: Players don’t win a game individually. Rather, everyone wins or loses based on whether everyone had fun or not. With that definition of “winning” in mind, a good player plays to win. David: Deckbuilders saturated the market extremely and people got sick of seeing them. I think we’ll first see more games using deckbuilding as more of a side mechanic to control smaller aspects of play and then we’ll likely see other standard mechanics such as worker placement make a comeback. Of course I wouldn’t mind seeing newer mechanics such as chaining end up in some other games. David: I don’t spend much time with print and play or other unpublished games, so can’t really answer this one. David: Just received Gosu 2: Tactics from my BFF for Christmas and have been enjoying it immensely. For Sale and Love Letter are also played frequently as we don’t often have time to play the longer games and they’re just excellent games in their own right. David: From recent memory Gosu 2 was a huge shock. I hadn’t thought that such a small box would contain so many tactical decisions or be such fun to play. Go was also a big shocker for me, not so much in the game itself, but in how hard a time I had finding people willing to learn it. Describing it as a game beyond Chess just made people cringe and back away… I certainly hope that unwillingness to apply one’s mind doesn’t become a trend. I don’t know much about Gosu but I would love to learn how to play Go. Maybe at one of the local cons. So long as someone has a set I’d be happy to teach anyone that’s interested in learning. It’s been a long time since I’ve played, but the rules are very simple and even the basic strategies are fairly easy to grasp. Janice Kim put out an excellent 5 book series that are enjoyable to read and will get you advancing in skill quickly. Tom: What is next for you? What else is in the que? David: I have a cooperative time-travel themed game being reviewed by a publisher now. Beyond that I have a couple ideas floating around in my head that I’m waiting to “gel” into something playtest-able. Tom: Time travel is one of my favorite literary themes so that game has me really intrigued. And let me know when those others are playtestable. I volunteer. David: I don’t read many novels, but I do much enjoy time-travel themes in movies, etc. It was The Time Traveler’s Wife that actually got me motivated to make this one! And I’ll certainly take you up on that volunteering; I can always use more members in my group. David: Board Game Geek hasn’t been mentioned nearly enough. Both the staff and users are amazing people and one of the best internet communities I’ve ever had the good fortune to spend time with. Tom: Thanks for that. You are right. BGG staff deserves a lot of kudos from us all. 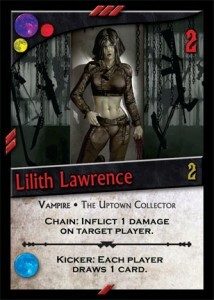 So a big THANK YOU to Aldie and all the rest of the folks over at BoardGameGeek.com! David: I go by S3rvant on BGG, Facebook, Reddit, Twitter and others. Feel free to message me anytime. David: My church uses the motto “Love God, Love People”. I think BGG does a good job with the 2nd bit and a lot of the community also has the first part down. I’d like to see more of both, not only on BGG, but in other online communities as well. I’d love to see 2013 become a year characterized as such. Tom: That is a good subject for a future Go Forth And Game post – a multi-person conversation about Christian gamers. I know Tom Vasel addressed it in a couple of podcasts called ‘The Dice Steeple’ earlier this year. But I know several local Christian gamers and would like to link us up a bit more. Thanks for the interview David. It was fun to learn more about Nightfall and you. Since the interview I’ve had a chance to meet and game with David as he is local. He is a great guy and a really smart player. You can see his mind working out strategies quickly as he plays. I’m looking forward to more gaming with him.